In the first post of this series, we looked at How Self-Criticism is Hurting You. It’s something we see in our San Francisco therapy practice with a great many people. Which means we have a lot of experience helping our clients navigate their way out of the hurtful path of self-criticism and self-judgment. 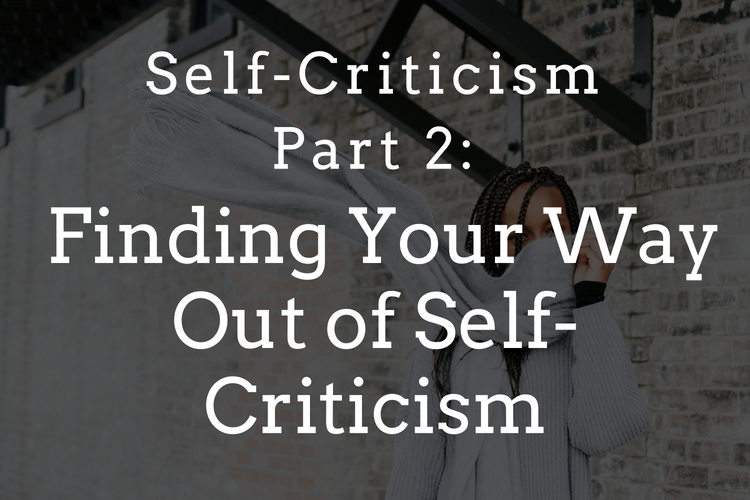 In part two of our self-criticism series, we share concepts you can use to find your way out of the cycle of self-criticism. If you struggle with self-hatred, shame, and have felt terrible about yourself, there is a way to heal. Self-awareness is the first step towards healing and changing. The first thing to do when you judge yourself is to notice that it’s happening. This will require that you are dedicated to noticing your habitual ways of thinking. Especially if the urge to judge yourself has been going on for years. The first wave is recognizing when you act in a way that you later regret. For instance, lashing out at your partner or child, reacting defensively at work, overeating or drinking too much, or watching hours of TV. When you find yourself doing things you wish you hadn’t, dig down deep to discover what’s really happening. There is likely a good reason for your behavior, even if you didn’t respond as skillfully as you would have liked. See if you can extend compassion and understanding towards yourself. The second wave is to identify the negative emotions when you’re feeling bad about what you did. This is the moment when you often catch yourself wanting to judge yourself. So, there is the first thing that was upsetting – a moment of conflict or disconnection or frustration. Then, there are the heapings of blame and shame you put on yourself for how you reacted. When you judge yourself, it really happens in a one-two punch sort of way. And you’re undoubtedly both the fist and the black eye. In short, it hurts you with a very distinct kind of pain. Obviously, it can be difficult to identify the two waves of noticing mentioned above and stop the cycle of judging yourself. But with the help of a supportive therapist, you can sort through the complex layers of emotion. Self-criticism is often rooted deeper than many people realize. No longer wanting to judge yourself is a positive life goal. Therapy can help you sift through the layers of self-aversion so you can love and accept yourself fully – warts and all. Ready to find your way out of self-criticism?